Today the ability to work on a computer has become a necessity. Computer literacy is a must in every field of Shipboard operation. 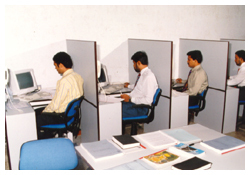 Many routine activities as well as advanced scientific calculations are being performed by computers. On ships, computers have made a late but definite entry. They are now being used widely for work processing, data entry, report writing, planned maintenance system, communication, navigation and engine control systems. Computer based training programs have made their advent and certainly in future years they will form the main medium of training. To be able to boot up and operate a computer using DOS based and Windows based commands. Be able to work on a computer for preparing letters, reports. Be conversant with usage of computerized Planned Maintenance System. Computer Concepts - hardware configuration and software applications. Networking various PC's to master Server. Course is tailored for shipboard Applications with practicals done on PC's, namely changing hard disks, ram, sound card, modem etc, network connections and settings performed. Numerous exercises are carried out on letter writing, preparing reports, notes of protest, calculating bunkers, provisions, preparing wages statements and storing information in databases.